If your case picking productivity ends with an empty pallet, you may not be maximizing the potential effectiveness of your order selection process. Empty pallet return lanes (EPRs) are gravity fed flow lanes positioned right within the pick area and are uniquely designed for efficient removal of empty pallets. Not just that, EPRs also protect pallets from damage, minimize pick area congestion and make the most efficient use of forklifts and pallet jacks. 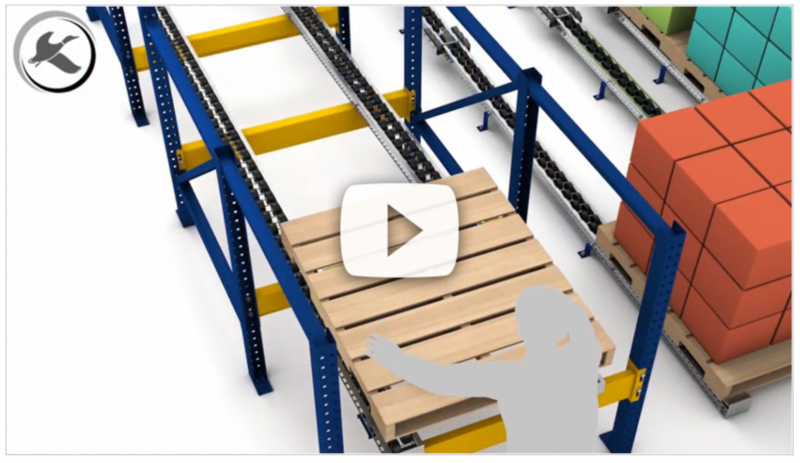 Because every warehouse configuration is different, Mallard offers four different empty pallet return lane types to best match your system and equipment needs. Each type is outlined in the video above. Our EPR lanes are all manufactured to Mallard’s strict standards for long-term use in busy warehouses. In addition, lane options include skate wheel, wheeled rail or split-roller to meet all warehousing climates and inventory handling requirements. The Stacked Empty Pallet Return – employs the use of the EPR-700 series pallet separator to allow for accumulating 5-6 pallets in a stack before releasing them to flow to a take-away aisle. A simple hand release is triggered to allow them to flow. The lane design ensures controlled, even flow for worker safety, and pallet protection. Pallets can be removed from the lane by forklift. The Vertical Pallet Return – this nifty space-saving option collects single pallets on their sides. Pallets are manually extracted to the forklift or pallet jack for restocking. Heavy-duty lane rollers and steel skate wheels combine to provide smooth, consistent and controlled flow. The Double-Sided Vertical Pallet Return – remove twice as many pallets while maximizing lane space in this double-sided vertical pallet return. Perfect for high-volume picking operations. Bolt-on ramp stops hold pallets in place in the lane until manually extracted to forklift. Contact the Mallard gravity flow experts to learn more about realized cost benefits of empty pallet return lanes in your order picking operation.